Successfully Added Mobile Theatre Video Glasses - Movies on 52 Inch Virtual Screen to your Shopping Cart. Imagine being able to privately watch movies on a 52 inch cinema display at any time: While on the bus, in the park, or even at the library... Well, this dream has now become a reality thanks to this Mobile Theatre Video Glasses! Portable DVD players and MP4 players are out, meet the newest and most high-tech way to watch movies on the go - the Mobile Theatre Video Glasses! Providing an advanced 52 inch virtual screen that will make you feel as if you are actually sitting in a real movie theater, this gadget is the ONLY way to enjoy your favorite media files on the go and in an amazing large display cinema-like quality. 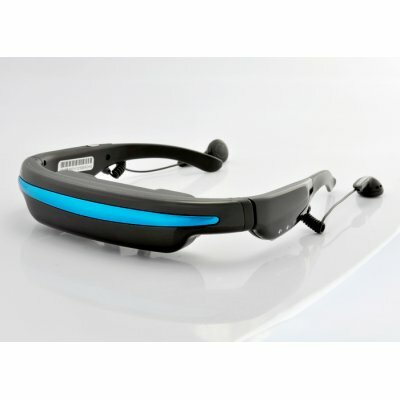 This Mobile Theatre Video Glasses are capable of handling a wide variety of media files and can play everything from movies to photos to eBooks to music. It also even features 4GB of internal memory for storing all your favorite media files, as well as a micro SD / TF card slot that can accept up to a 32GB card - enough memory for your whole media library! Best of all, the glasses themselves are lightweight and comfortable enough to wear for extended periods of time and the battery will last more than long enough for a movie or two! If you are looking for the ultimate portable media player then you have definitely found the right product. And to make sure everyone can enjoy these incredible video glasses, we have purchased an even larger supply stock than normal so we could offer you this product at the lowest price possible. Order this amazing product now and we will express ship your order by tomorrow. And don’t forget this product is fully backed by our 12 month guarantee and is in stock now and available for single piece or bulk orders. A great gadget to bring to the airplane to keep yourself entertained on long hour flights. Great image and sound quality. How can you offer these video glasses at such a low price, is the quality also low? The quality of these video glasses is excellent. We are able to offer such a low price because we purchased this product directly from the factory and in bulk quantities. This gives us a much better purchasing price and allows us to pass the increased savings to you. Will these video glasses hurt my eyes? No. These video glasses are 100% harmless.